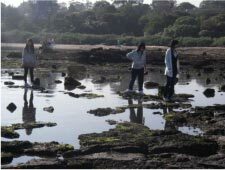 Student Banner Competition successfully comes to a close Victoria’s Seaweek 2008 came to a close last week with a celebration of School students’ creative Sea Art at Rickets Point Marine Sanctuary. The 2008 MESA Seaweek banner competition called upon the creative talents of school students to promote the 2008 Seaweek theme, “Extinction a saw point”. 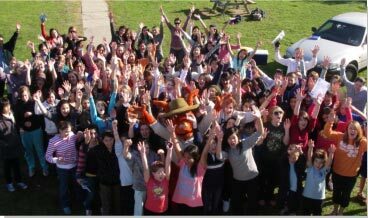 It drew entrants from a range of Primary and Secondary Schools across Victoria, with over 45 banners submitted for judging. Some of the banners focused on the Sawfish, a charismatic, yet critically endangered animal from Northern Australia. Many other banners showcased the threatened fauna of Victoria, while others depict the processes that currently harm our wonderful and diverse native sea creatures. The awards ceremony was attended by over 100 school students from across Victoria who came to view other students’ banners and to hear the judges’ final decision. 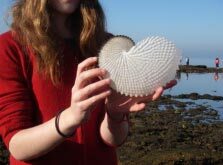 The day enabled students to get up close and personal with some native marine creatures on the intertidal rock platform before they were treated to a showing of all the banners at the Beaumaris Life Saving club. 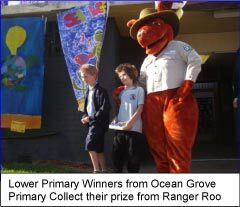 Winners were announced at an official ceremony and prizes were awarded by special guest “Ranger Roo” from Parks Victoria. Mark Rodrigue from the competition’s official sponsor organisation, Parks Victoria, opened the ceremony with an acknowledgement of the traditional owners of the country. He also acknowledged the generous support of our partner organisations, Melbourne Aquarium, the Marine Discovery Centre Queenscliff, and Seanet, who supplied prizes and support for this competition which was launched during Seaweek via a special webcast presentation “Grey-Nurse Sharks: on the Brink”. This unique event was held at the Melbourne Aquarium and involved talks from Melbourne Girls' College students Sarah, Sian, Lucinda and Ella, Melbourne Aquarium Education officer George Cunningham, experts from Parks Victoria and MESA and a man who can talk underwater and across the internet, Garret Drago, a diver who feeds the sharks at the Melbourne Aquarium. Members of the public, school students present in person or over the internet were able to ask the diver questions and found out amazing features of both the Green Saw Fish and the Grey Nurse Shark, but also the sad plight of these majestic animals. Rickets Point, the location chosen for the awards ceremony was significant. Many banners focused on the threatening processes that affect our wonderful Marine Life and highlighted the need for marine protected areas. Ricketts Point has been a haven for local marine life for over five years, since it became one of the state’s 11 Marine Sanctuaries. Together with the 13 Marine National Parks, these islands of protection make a critically important contribution to conservation by ensuring that representative areas of Victoria’s marine habitats are safeguarded from all extractive activity, and that serve as a focus for community effort to reduce threats to the marine environment in general. These areas complement our extensive parks and reserve system on land. At a time when climate change, habitat fragmentation, and the impacts on waterways of vastly altered catchments, all place pressure on our marine and coastal systems, we will come to increasingly look to the protected area system to ensure some of our unique and diverse marine biodiversity is maintained and to ensure that more species do not go the way of the Grey Nurse. Looking to these challenges it is critical that young people work together with the agencies and organisations charged with caring for the environment. We all need to recognise and communicate the values of our marine environment; to identify a range of strategies to protect important values and habitats; and most importantly work together to reduce the impacts of human activity on the global marine environment. MESA would like to thank all the students and their teachers who put in such a huge effort to complete such a high standard in their banners. It made the judging difficult, but reassured me that the future of our Ocean is in the hands of caring, well informed people. The messages are passionately stated and creatively portrayed. The banners will be on display over the next two months at Parks Victoria Education centres, after which they will be returned to their creators. Written by Andrew Vance, Victorian MESA representative, with extracts from Mark Rodrigue’s address on the day, Monday 16th of June 2008. People’s Choice winners: Primary category: Haileybury Girls College grade 6 students with: “When will it change?” Secondary category: Melbourne Girls’ College Marine Biology Students with: “The Sea Shepherd” Winners received complimentary class trips to the Marine Discovery Centre or a Parks Victoria Education Centre amongst other prizes.